Activity on Albedo could supplement the activity to ensure a better understanding of the impacts of black carbon. In-class discussion will generate several broad topics relevant to the use of black carbon generating fuels. 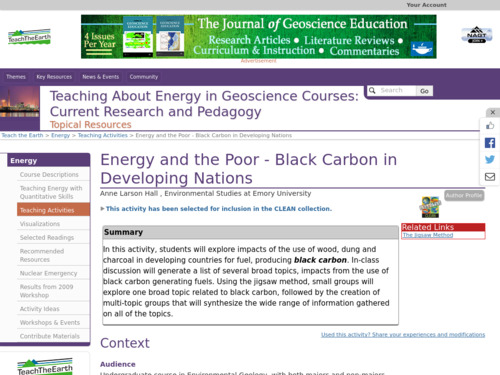 Using the jigsaw method, small groups will explore one broad topic related to black carbon, then multi-topic groups will synthesize the information gathered. Possible source for confusion: Black carbon isn't a greenhouse gas, but the soot particles warm the atmosphere by absorbing heat and reducing albedo when deposited on ice and snow. Well-designed activity with a good introduction to the topic and an effective pedagogic design. Using the jigsaw approach addresses needs of students with different learning styles. Many sources beyond this activity are given for further research. Educator will need to develop their own assessment.